Melinta, Are We Getting the Message? We had our webinar-Clinical development for non-developers Part 3: Non-traditional Approaches yesterday. You couldn’t have a more authoritative and experienced set of presenters. What are “non-traditional” antibacterials? Based on our discussion yesterday, I think its better to think about what the products will do and how they will be developed. Any protein, antibody, peptide, bacteriophage cocktail or other that can be developed and used as a stand-alone therapy can be studied clinically in a traditional indication such as ventilator-associated pneumonia, urinary tract infection, etc., using a non-inferiority trial design. This is by far the lowest risk way to proceed to demonstrate efficacy. For these products, CMC and safety studies that will be required are quite different than those required for small molecules. For those products that cannot be studied as stand-alone antibacterials, such as inhibitors of virulence, critical but non-essential bacterial functions such as RecA for example, immunomodulators that might target host functions, therapies directed at the microbiome and others are more challenging to develop. One main problem will be coming up with a rationale to justify dose selection. Will you be able to use standard animal models of infection to carry out PK/PD studies to justify dose or not? If not, you may need to carry out dose ranging trials in the clinic before proceeding to pivotal trials. A second major decision will be to determine whether the drug will be developed as part of a fixed-dose combination with a known antibiotic or whether it will be adjunctive therapy to standard of care. If it will be developed as a fixed-dose combination, you will need a strong rationale showing a dramatic effect of the new drug on its partner’s activity to justify this approach. If it will be developed as adjunctive therapy to standard-of-care, you will ultimately need to carry out superiority trials. In the latter case, the challenge to show superiority will be a significant one and not one to be undertaken lightly. In thinking about this, I have come to understand that there is also another issue – one that John Rex has mentioned frequently. That is, the value proposition. 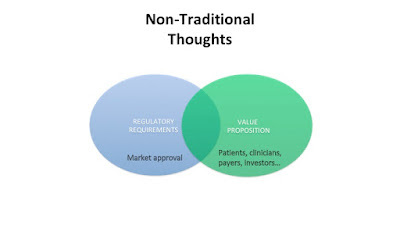 Regulatory requirements to achieve market approval are one set of challenges. But a plan to show the value of the new product to patients, physicians, payers and investors is another. I think of this as a Venn diagram. Demonstrating the value of the product to this important group of stakeholders is as important as obtaining market approval from the regulators. While non-inferiority trials for these products (when developed as fixed dose combinations) may allow for regulatory approval, they may not be sufficient to fulfil a value proposition. Positive data from superiority trials are more likely to fulfil a value proposition, but the chance of success in these trials as currently envisioned is low. Everyone participating in the webinar agreed that this is new territory. We do not have any real experience in developing or using non-stand-alone products like these. From the regulatory point of view, much will have to be decided on a case-by-case basis until we get a better understanding of how to develop these products. The regulators on both sides of the Atlantic are willing and even eager to hear from sponsors delving into this area. They are open to listening to project proposals and providing advice even at the earliest stages of scientific investigation. I would encourage those of you working in this area to take advantage of this possibility before investing significant resources in product development. Dr. Nambiar has provided a number of links in her presentation materials to prior FDA workshops and advisory committee meetings that have examined this and related areas. Non-traditional products that cannot be stand-alone therapy remain a very high-risk endeavour. Any company working in this area should have a portfolio of projects that spread risk across more than one approach. Have a Target Product Profile that is developed based on medical need and on a value proposition. Use experienced clinicians and scientists here. Speak to regulators early on about CMC, safety and efficacy. Musings on Penicillin: Can We Learn from History?